Fall is in mid-swing. Shorter days. Cool days and nippy nights. Beautiful colors. Falling leaves. Cider mill trips. Hay rides. There’s a lot to love. One thing that many do not love is raking leaves. But, I’m here to tell you that you don’t have to! There are alternatives to raking leaves. Here are some of the different things you can do, and why they might be beneficial. Can You Ignore Your Leaves? 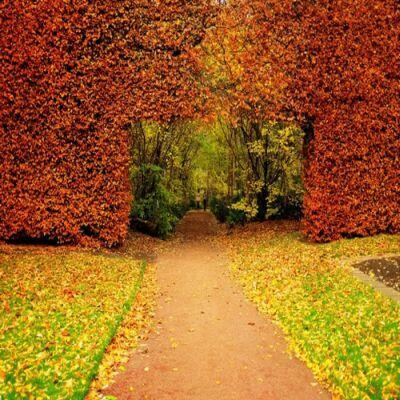 When leaves fall, they eventually break down and basically turn back into dirt. I’ve always thought that process is pretty amazing. It is, if you think about it, right? Unfortunately, you can’t just let leaves go unattended. There are several drawbacks. A thick covering of leaves will choke out the grass underneath. Leaves that aren’t collected will blow around and go to places where they’re not supposed to go. Unattended leaves can pile up and reroute natural drainage paths. So unfortunately, most people will have to do something with their leaves. Simply leaving them on the ground isn’t a viable option. If you have a mulching lawn mower, use it! Leaves are the perfect thing to mulch. Remember above how I said that leaves basically decompose into dirt. This is great for your lawn. The thing is that the pieces have to be small enough to break down quickly. If you use your mulching mower, you’ll break the leaves down into tiny pieces. These pieces will break down quickly. Plus, they get that small, they’ll fall in between the blades of your grass. This means that you the leaves won’t choke your lawn as they would if you leave them on top of the grass. On top of it all, leaves that break down will provide a natural fertilizer to the grass. There are some drawbacks. When leaves fall fast and furious, you have to mulch them very frequently or else the leaves can get too thick for a mower to handle. Even in some cases, you’ll have to mow over some spots a couple of times so that the machine can break the pieces down into small enough sizes. Another drawback is that fall often brings rainy weather. Sometimes, it may seem like the leaves are never given the opportunity to dry out. Unfortunately, mowers aren’t going to do that great of a job on sopping wet leaves. All you’ll end up likely doing is clogging up the mechanism. In this case, you might have to pull out the rake. Raking is hard work. I find that my shoulders are sore for days if I have to rake the whole yard. But, even if I have to collect the leaves, I’ll now save some of the raking and use the leaf blower. Blowing the leaves into a few piles makes it a lot easier to put in bags. If you live in an area that allows it, you can burn your leaves. Unfortunately, you still have to collect them before you can do this. We live in a suburban area that has banned leaf burning, so unfortunately this doesn’t work for us. But, I do enjoy driving by areas where people still do this. The smell of burning leaves is definitely a fall favorite! Falling leaves will settle into your grass pretty quickly. One thing you can do is give the leaves less of an opportunity to settle by cutting your grass shorter. Then, the leaves have a better chance of blowing across your yard. Yes, you’re making more work for your neighbors, but that’s up to you as to whether you worry about that or not! Hopefully you’re enjoying your fall. I hope that if you trees nearby, that these alternatives to raking leaves have helped. Readers, what alternatives to raking leaves have you come up with? Or do you just prefer good old fashioned raking? Please let me know in the comments below.